In my haste to get my post published yesterday, and in an earnest attempt at keeping it short, I completely forgot about one of the highlights of 2012! Not only is October my favorite month of the year (Hello, Halloween!! ), but it’s Mister’s birthday month. So for his birthday in 2012 we planned a trip to Oregon to bring the kids there to meet his family. We had such a wonderful time! Josh decided to interrupt just about every conversation by popping in with, “Just a random thought…” and then go on with some odd thought. Mike and Jan also served lunch and set out a veggie tray around 11:30 am. The kids, who had eaten heartily at the Residence Inn breakfast buffet acted like I had not fed them in two weeks. There they were, three children hovering over the vegetables, shoving them in their mouths like they were marshmallows dipped in the chocolate fountain at the Golden Corral. I gaped at them for a moment before having to shoe them away like flies. My kids don’t even LIKE vegetables. I really think it was some bizarre plot to make me look like a bad mother who forgot to teach social graces to her children. On Mister’s birthday we went to our favorite pizza place in the whole wide world… Padington’s Pizza. His sister had planned a surprise party for the afternoon, so we let him think we were just going out for pizza and “dessert” at her house afterwards. We met Mister’s other son and a few of his children there, as well as Mike and Jan and Mister’s mom. We had a delicious lunch (Whippersnapper…Yum! ), then headed to Jan & Mike’s house. Mister is a big Jimmy Buffet fan, but he’s never been to a JB concert. So, I bought tickets and a room in Vegas for an upcoming concert, and let Jan know what I planned. So she decorated her house in a tropical theme and had Jimmy Buffet playing in the background when we got there. Mike made this huge palm tree decoration, it was incredible! I wished we could have brought it home, but there was no way to take it on the plane. Funny thing is, Mister didn’t even put together the tropical theme or Jimmy playing in the background until he opened his present from me and saw the tickets. Frankly, I was a bit puzzled at his initial reaction, because he did not look excited at all… more confused. Then he admitted that he thought I was buying him tickets to Atlas Shrugged Part II in Vegas (Wha?! Seriously?! ), so he was a bit uncertain as to what the tickets were. Anyway, we had Jan’s delicious cake with a mexican chocolate mousse filling (to. die. for. ), and had a pretty fantastic day. The trip went by far too fast for us, but we thoroughly enjoyed it. It was such a treat for the kids to get to know his side of the family and see how kind and amazing they are! Ready to eat some yummy food! 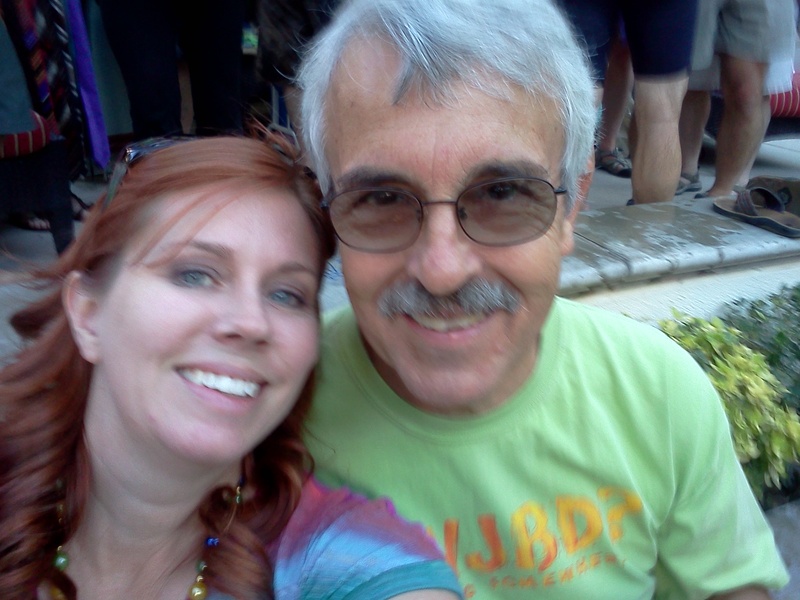 The other fantastic part of October was… The Jimmy Buffet Concert!! BOY HOWDY, did we have fun!! A couple of weeks after our Oregon trip, we drove up to Vegas in the morning and I took Mister to Margaritaville for lunch. 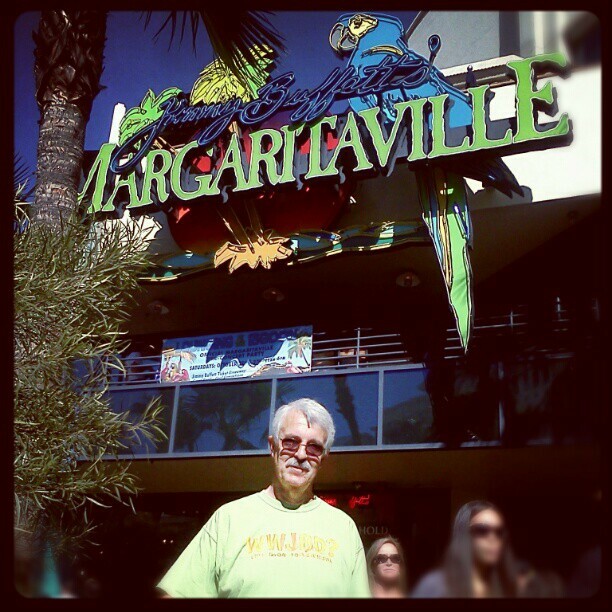 I mean, how could we go there for the concert and NOT go to Margaritaville to eat?! Hangin’ out at the pre-concert pool party. After that we headed over to the Flamingo pool for the pre-concert party. That was so much fun we had to take a little nap before the actual concert! Then, it was on to the MGM Grand Arena and the concert of a lifetime (to me anyway!). 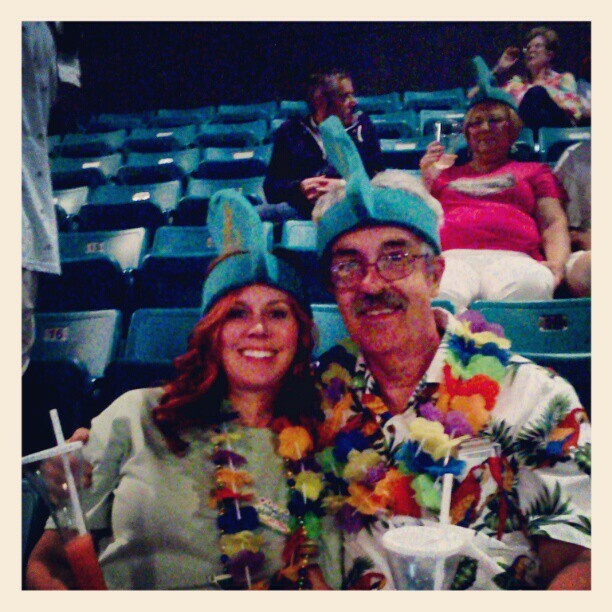 I wore my styrofoam fin hat with pride, and a whole lot of giggles. I think Mister and I laughed and smiled and danced (he doesn’t dance normally, but everyone else was too busy dancing to notice him anyway), and laughed some more. What a fantastic day! Whew. Good thing I made a separate blog post. I am WAY too wordy! By the way, I changed the blog appearance. I thought it needed a fresh look. I hope you like it! Have you had favorite birthday or concert experience? Don’t forget singing at the top of our lungs with the rest of the thousands of folks at the concert…or the “1/2 yard Margaritas”. That was a real treat and a wonderful birthday present. This is a bit late, but…I was more behaved than the younger two! I even asked if Aunt Jan needed any help with getting lunch set up. My one bad moment (that I know of) was the vegetable tray.